Often referred to as lady's fingers, okra is popular vegetable in the south of India (where it is mostly used in dry curries) and the southern states of America (where it is used in a variety of recipes including gumbos). Relatively unknown in Northern Europe the okra is a long green pod with a ribbed and slightly fuzzy skin. The inside of an okra pod has a somewhat gooey texture and is full of edible, creamy seeds. When cooking, okra exudes a glutinous juice which thickens stews and braised dishes. Okra plants easily cross-pollinate so if you are planning on saving seed from your plants it is best to plant just the one variety - otherwise the resulting seedlings will not grow true to the parent plant. When harvesting Okra pods for culinary use they are best picked before they get any bigger than 3 inches long. If they are left to grow any larger they will begin to give off an unpleasant woody flavour together with a rather unpalatable texture. However, if you want to collect seed from them it is best to allow the pods to get as big as they can. Either pick them off the stalk so that they can be dried off indoors or allow the pods to dry off naturally on the stalk before harvesting. 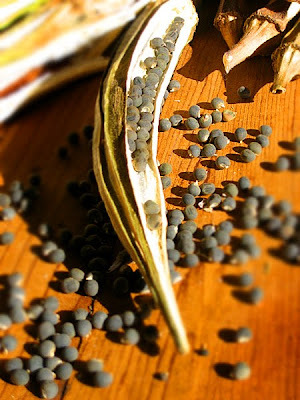 Have a bowl on hand to collect the seeds then either twist the dried pods in your hands to break open the seed or slice the pods lengthwise from top to bottom, prying the pods apart at the slit with your fingers -the seed will fall out quite readily. Dry the seed thoroughly for several days, then store in a cool, dry place in tightly closed containers until next season. Okra seeds have a history of not storing well so you will need to collect new seed each autumn for use the following season. Okra seeds are unlikely to remain viable into their second year. When it is time for replanting, soaks the seed a couple of hours before planting.